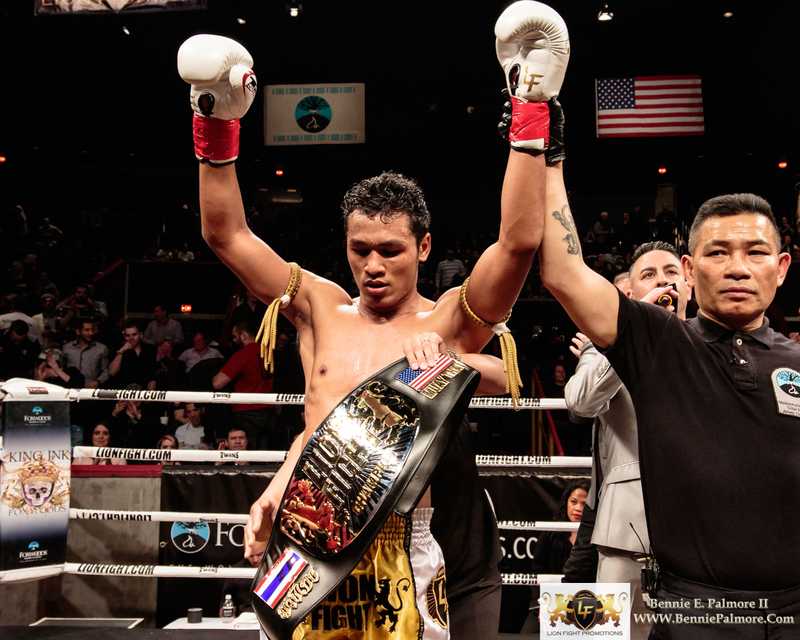 “Smokin” Jo Nattawut will once again put his illustrious Lion Fight super welterweight title on the line when he battles Lumpinee Stadium champion Yodpayak “Tua” Sitsongpeenong at Lion Fight 29 as North America’s premier Muay Thai promotion returns to Foxwoods Resort Casino in Mashantucket, Connecticut on Friday, May 27th. Tickets for Lion Fight 29 go on sale at 10 a.m. ET on Friday, March 25th at www.foxwoods.com or by calling 800-200-2882 or by visiting the Foxwoods Box Offices. “Our main event for Lion Fight 29 pits two unbelievably talented fighters in the ring against each other – a gifted and accomplished champion against a brilliantly skilled challenger,” said Scott Kent, President & CEO of Lion Fight. Nattawut (56-5-2) returns to the Lion Fight ring on the heels of retaining his title with a victory over Cedric Manhoef at Lion Fight 28. Nattawut, who fights out of Atlanta, Georgia, capitalized early and then used superior defense and speed to dominate his way to a unanimous decision (50-45, 49-46, 49-46). Following a victory over Cosmo Alexandre, Nattawut was crowned champion at Lion Fight 22 with a dominating decision win over Salah Khalifa. He defended his newly won title at Lion Fight 24 by way a third-round TKO finish of Charlie Peters. Thailand’s Yodpayak (born Waranat Ponnikom) comes to Lion Fight on a tremendous run of success. He opened his 2016 campaign with a victory over Russia’s Mogomed Zaynukov, and then continued his winning ways by claiming the Lumpinee Stadium super welterweight championship with a five-round win over Sirimongkol Sitniwat. Yodpayak (138-39-2) notched three impressive victories in 2015, taking decisions from Tengnueng Sitjaesairung and Fahmongkol SJ Danrayong, plus a third-round knockout of Teedet Sitjakoong. The 23-year-old is also the reigning Omnoi Stadium super welterweight champion. Yodpayak’s teammate Dechsakda “Num” Sitsongpeenong will also be in the lineup for Lion Fight 29 as he steps up in weight to face former Lion Fight lightweight champion Ognjen Topic. Dechsakda (born Wanathep Nupan), a former Lumpinee Stadium super bantamweight champion, is ranked #2 in the world by both Lumpinee Stadium and WBC Muay Thai. Dechsakda (66-27-4) started 2016 off with a five-round verdict in a rematch with Wancha A. Bunchuay. The 22-year-old posted three wins in 2015, earning decision victories over Ploywittaya Moosapanmai, Pateng Kiatponthip, and Bunchuay. Topic (17-6) lost his crown at Lion Fight 28 when he was stopped by new champion Sergio Wielzen (42-9-2) in Round 3 after sustaining a deep cut over his eye courtesy of a vicious elbow. Topic, who fights out of Lodi, New Jersey, originally won the lightweight title at Lion Fight 24 when he took a unanimous decision from Stephen Meleady. A mindful tactician in the ring, Topic (Twitter: @TopicOFC) was Muay Thai Authority’s Pro Rookie of the Year in 2011 and went on to win WBC and WKA titles along with numerous “Fight of the Night” honors. More main card fights as well as the undercard will be announced shortly. Lion Fight 29 was originally schedule to take place at Pechanga Resort & Casino but due to ongoing renovations, Lion Fight will be rescheduling all its 2016 events slated for the resort to new locations. Lion Fight is expected to return to Pechanga next year.